Idlewild creek home brew with one gallon with vanilla bean, another gallon with oak burboun chips, and the rest all natural. The Robust Porter, Idlewild Creek, that I brewed on February 20th, is now in the bottle after a few hours of work this morning. The beer was in primary for two weeks as I wanted to harvest the yeast to brew this again soon. Idlewild Creek then sat in the secondary for a week, mainly for the two specials to age. 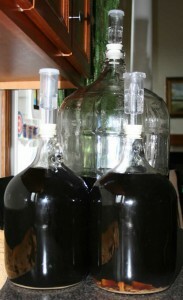 The two specials are one gallon with vanilla bean (about a quarter of a bean) and another gallon with oak and bourbon. Based on the aroma and flavor, I would add more vanilla bean to the one gallon carboy in the future and/or let it age more than a week. The oak, bourbon batch was pretty close to what I wanted. The oak wasn’t over powering but I did add an extra ounce of Makers to the bottling bucket to up the ante on bourbon. I had soaked about .2 ounces of oak chips in two ounces of bourbon for a week before the original racking to the one gallon carboy. The last three gallons, which was straight forward, had a really nice roast flavor and, even flat, was damn tasty. I am looking forward to trying all three of these beers in the next three to four weeks. free run 6 v2 femmes My basement is about 56 degrees this time of year and bottling conditioning seems to be a little slower. The only thing I can say about home brewing: if you get the itch, it will keep scratching. Enjoy! This entry was posted on Sunday, March 14th, 2010 at 6:06 pm	and is filed under Home Brewing. You can follow any responses to this entry through the RSS 2.0 feed. Both comments and pings are currently closed.